Hello, I am disappointed because in this version there is no pull up resistances for the 3 push-buttons... The plan that I seen had these resistances and it is much better. How to make now?. Are there any knobs available for those sliders? Getting errors while trying to upload the sketch Please help! This one is WAY More Dangerous. hello, do you sell that kind of foam that can be seen on those sliders? if I buy the sliders and not the whole kit, I get that foam? The sliders themselves come assembled with the foam. We don't sell it separately. You should be able to find something equivalent at a craft store though. Actually, they are the same sliders. The individual sliders pictures simply show them with the foam peeled off. If you build this, don't install the 10k resistor immediately along the flat side of the temp sensor. 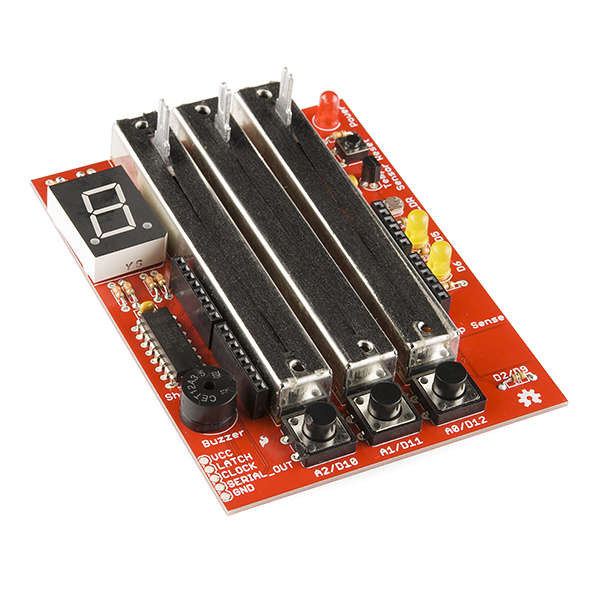 It is a pull up on its output and, at least with the TMP36 sensor included with my board, will lead to malfunction. It may be needed with some other part. So build everything else, try it out. If you are satisfied with the results then it's all good. If not, investigate further. It took me some hair pulling to figure this out, so be warned. The resistor also does not appear in the schematic posted on this page. There are two versions of example code. The one in the link above is from V1.6 and it is the one with the outdated CapSense Library and the infinite loop that doesn't let you cycle back to the top of the 7 test states. 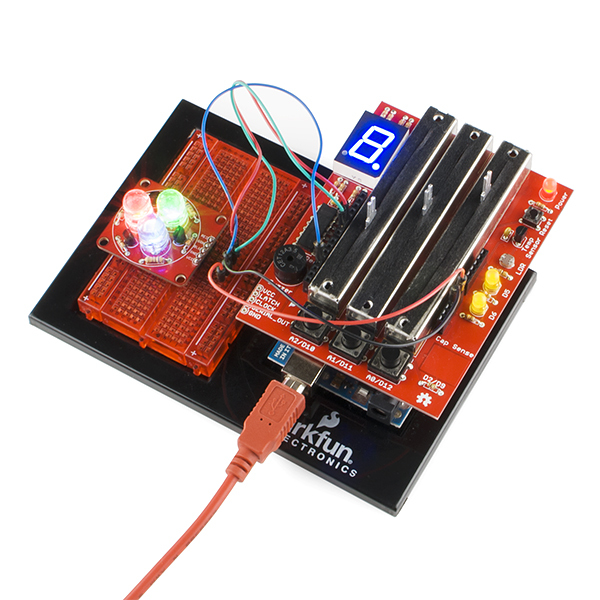 I went to fix those on the GitHub repo, but discovered there is actually updated example code for V1.7 that SparkFun did. It is an improvement on the old example code, if not a little different. Be sure to read the code comments to know what it is doing. On my Uno, the legs of the buttons D10 and D11 can just touch the USB connector, if the board is pushed all the way down. If the buttons were moved 1/16" ( say 1/8" to be safe) in the direction of the faders, and the faders moved appropriately, then there would be no issues. 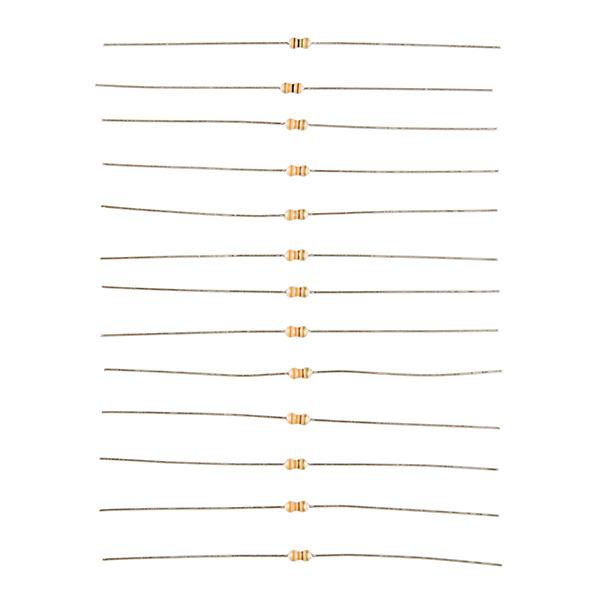 list of resistors above list 14 resistors, 11 x 330 Ohm + 2 x 10K Ohm + 1 x 1M Ohm. The package I bought, the image of the resistors above both have only 13 resistors. Both are missing a 10K Ohm resistor. The board shown has a component near the temp sensor which looks a lot a resistor should go there but it isn't labelled as such on the board, ie. there is a small rectangle with two holes in it, but no "10K" label. The LAST danger shield I bought had no 1M Ohm resistor included. 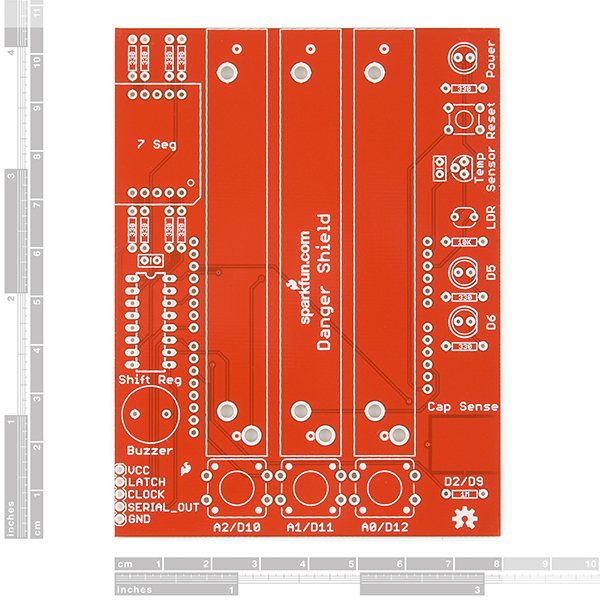 I look forward to the day I can buy one of these and have 1) all the components listed actually present 2) have either the board or the package list a version number so that I might know which of the (now 4 versions) of this product are listed on this site. Sorry to hear about the issues with this board. 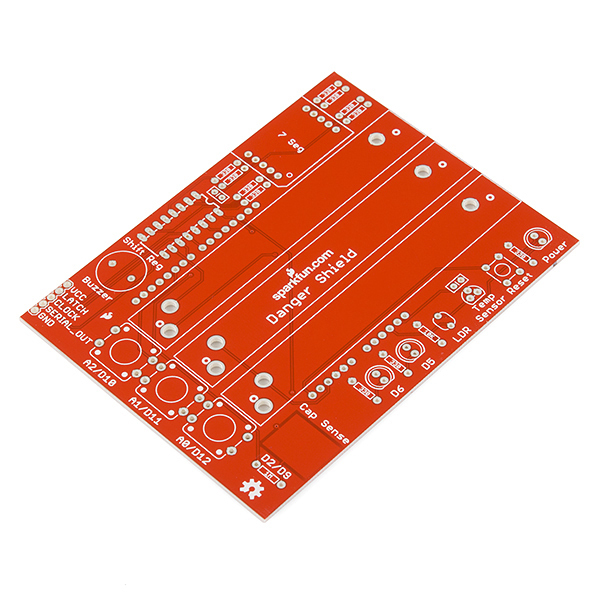 The current version we are sending (v17, as the schematic and GitHub pages both show), actually only require 1 10K Ohm resistor, which connects the light sensor to gnd, if you look on the schematic. So as long as you received one of them, then you do have a complete set. It looks like the product description never got updated with the new version release, so we'll get that fixed to avoid any additional confusion. 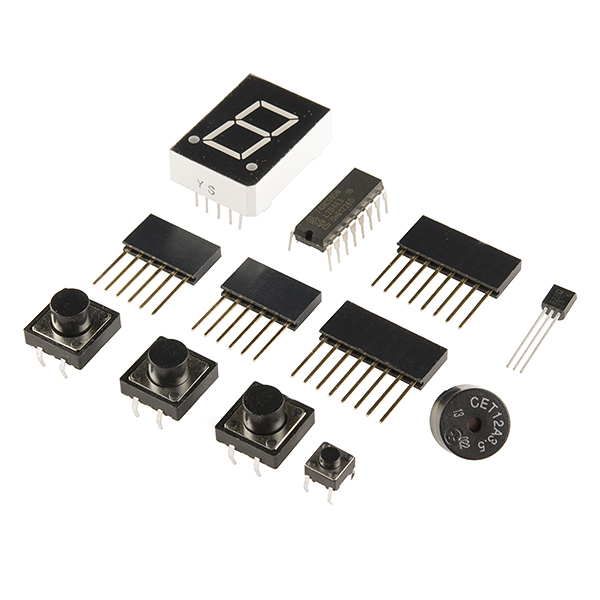 The component near the temp sensor that isn't labeled is actually C1 (or 0.1uF cap). I'll make sure we get a bug in for that to get fixed on the new revision of the board. Apologies again for the confusion, and if you do ever end up missing a part in one of your kits, contact our technical support team and they'll get the proper replacement parts sent out to you ASAP. Thanks! Yeah I figured that out. There are actually two 0.1uF caps, so do miss that. I put my new (2nd) danger shield together, shortly after I made this post. I have yet to test it but am hopeful that all aspects/components will work fine. 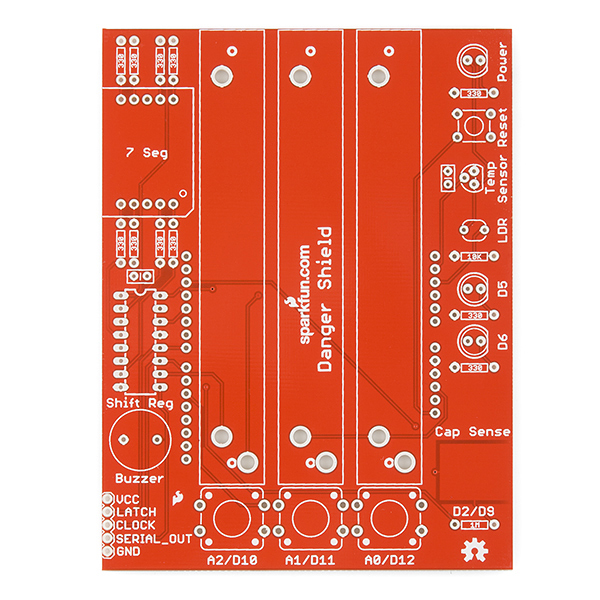 Please note that along with the parts list above which appears correct now (THANK YOU) your danger shield tutorial (called the Danger Shield Landing Page) needs updated to reflect the changes in the new Danger Shield version: DEV-11649: https://www.sparkfun.com/tutorials/274. I still think it'd be a good idea to print the version number on the board itself and update the web site to show the various versions and the differences between them. I love this product and your other products as well and THANK YOU for being prompt with your reply to my post! What is the proper orientation of the buzzer? 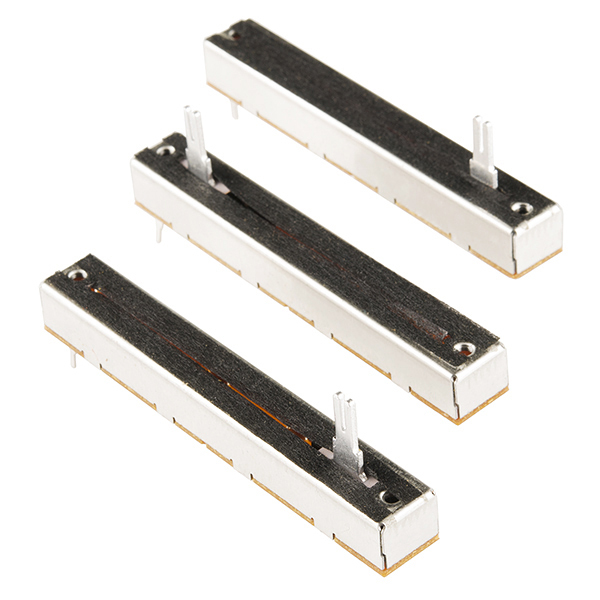 Should the positive lead be near the outside of the board or inside? 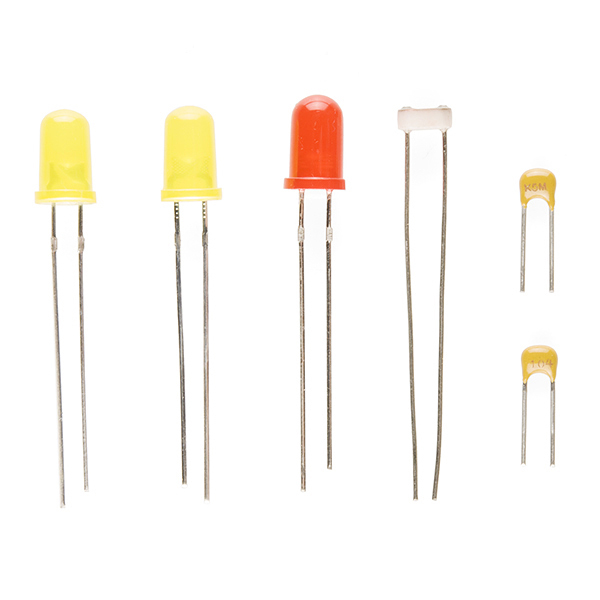 While the component is marked, the board is not. 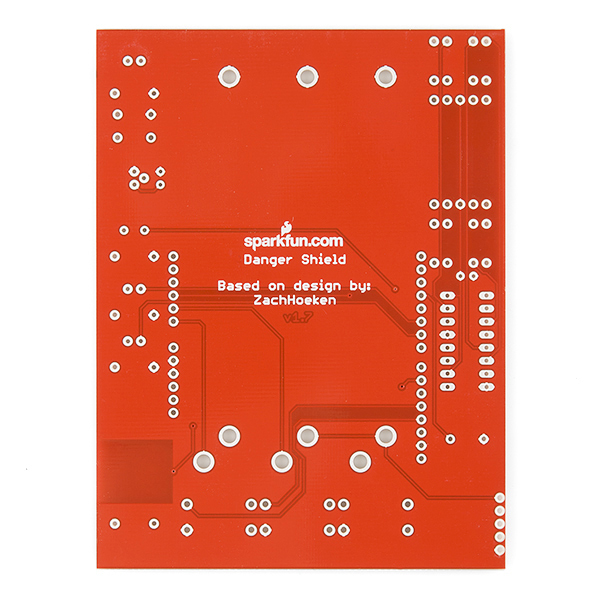 The buzzer is non-polar, so like the buttons, can be mounted without concern for direction: https://www.sparkfun.com/tutorials/274. Danger Shield? Danger is my Middle Name! Literally. I had the same issue. Is a revision of the sample code coming? What is the difference between this and the last version? I can't tell. EDIT: Temperature sensor was changed. And a cap added near the shift register. This is an expensive shield, and I don't quite feel like the quality matches the price. The original danger shield had LEDs built into the sliders, but this one does not. If you are willing to get a non-RoHS version, check out the one from Seeed studio. It has a smaller 7-segment LED and no capacitive touch space, but it does have LEDs in the sliders. Thanks for the review. There are many other versions of this product out in the world. I believe you may be thinking of someone else's board. Ours have never had LEDs in the sliders.